Much in Three Bears fashion, the Three Points have totally different approaches to finding tasty things to cook. Molly is an Internet gal, culling a lot of recipes from the Web with nary a cook book in sight. Rebecca has select cook books and keeps up with food trends through magazines and her culinary forays into the New York food scene. Kate, meanwhile, buys cook books like other women buy shoes (200-plus and counting). No matter how we approach food preparation in the kitchen, we do default to the things we know and like best. So to push boundaries, we are launching the Three Cubed Project on March 27 (3/27). Along the way, we hope to enhance our repertoire and discover new favorites. At worst, we might foist some questionable concoctions on friends and family. But there’s no such thing as a free lunch, amigos! The arbitrary plan is this: We crack open a cook book or magazine, make what is on Page 327 and document the results. (When the book is shorter, we go down to Page 227 or 127 or 27, depending on what is first available.) We’re starting with Page 327 because it starts with 3 (did I mention this was arbitrary?) and, if we stuck with a simple 3-cubed model (Page 27), we’d likely be making a whole lot of salad dressing or, if it’s an older church cook book, Jell-O salads. And nothing good can come of that. 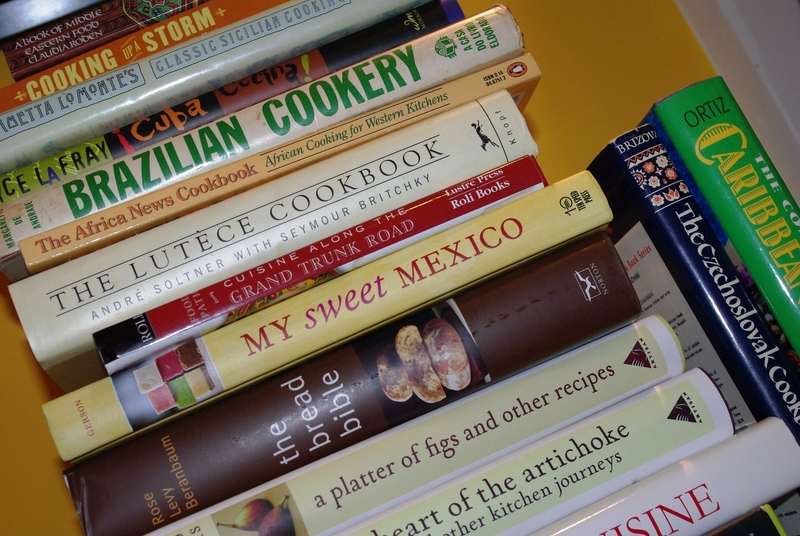 When some of us run out of cook books, we’ll move on to magazines, what’s in the library or, possibly, to guerrilla actions involving sneaking recipes out of other people’s houses. And if we have already made the Page 327 dish, we have the option of moving to Page 227 (or 427). Look for the first foray on Sunday, 3/27! And feel free to join in the fun. I’m so excited! Though limited in number of owned volumes, I’ll be cracking open many of my hardcover cookbooks for the very first time! (I mean, I read them and drool over the pictures, but I never actually cook anything from them when push comes to shove, er, dinner comes around again at 8 p.m.). I think I’ll start with my B&O cookbook, speaking of jello. Great to challenge… can’t wait to see where the roll of the dice takes you!! I’m house-sitting in Riverdale, ‘da Bronx, and the only cookbook in the house is, remarkably, Mastering the Art of French Cooking! Is it mere coincidence that the owners left a Le Creuset out on the stovetop? Sometimes the universe doesn’t just send you a sign, it shouts at you! Julia was going to work her way into the mix eventually! My method has always been the other way around. Buy/get from CSA the unfamiliar ingredient and find a recipe. This is much less time consuming (or maybe not depending on the ingredients) and I can actually try the recipes I skip over in search of that ingredient.